The WAAFL is honoured to induct one of the modern greats of amateur football in David Perry into the WAAFL Hall of Champions. 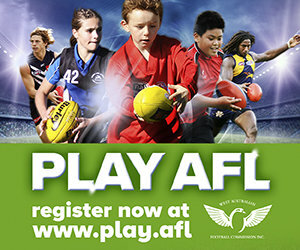 Dave Perry began his WAAFL playing career with the North Beach Amateur Football Club in 1985. His 93 games for North Beach between 1985 and 1990 achieved many team and personal accolades at the highest level of amateur football in Australia. 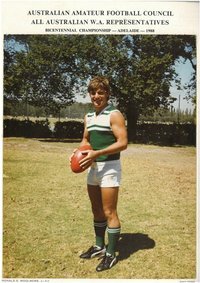 In 1986, Perry was selected in the WAAFL State Team to play in the Australian Amateur Football Council Carnival in Melbourne. He was recognised as WA’s best player of the carnival and selected in the All Australian Amateur Team. Later that year, he was awarded North Beach’s Aitken Medal for Champion Footballer and runner-up in the club’s A Grade fairest and best. Similarly, in 1987 he was chosen to Captain the WAAFL State Team against South Australia in Perth and again won North Beach’s Aitken Medal. He completed the season by winning North Beach’s A Grade fairest and best, and the C.J. Jamieson Medal as the WAAFL A Grade’s fairest and best player. He went on to win the C.J. Jamieson Medal again in 1989, a year in which he was part of North Beach’s first A Grade Premiership. In 1988 he was chosen as Captain of the Australian Amateur Football Council team which played in Division 2 of the AFL Bi-Centennial Carnival in Adelaide, was awarded North Beach’s Aitken Medal for the third consecutive year and won his club’s A Grade fairest and best for a second time. Additionally in 1988, Perry was chosen to Captain the WAAFL State Team in the Australian Amateur Football Council Carnival in Launceston. At the completion of the carnival he was selected in the All Australian Amateur Team and recognised as the best player of the carnival. Perry finished his career by winning another A Grade premiership with North Beach in 1990. It is with great pleasure the WAAFL inducts David Perry into the Hall of Champions as a Champion.